Map from Champlain's description by W.F. Gangong, 1911. Samuel de Champlain described many Native American settlements along the coastline of what is now Cape Ann. Native Americans began settling there more intensively in the Late Woodland period. Native settlers established villages by the time Europeans came, as suggested by archeological remains. Their rubbish heaps, called shell middens, showed they ate foods from the land and sea, including quahogs and animals. Sites near Salt Pond also revealed evidence of corn being grown. "I made them understand as well as I could, that they should show me how the coast trended. After I had drawn for them with a charcoal the bay and the Island Cape, where we then were, they pictured for me with the same charcoal another bay which they represented as very large. Here they placed six pebbles at equal intervals, giving me thereby to understand that each one of these marks represented that number of chiefs and tribes. Next they represented within the said bay a river which we had passed, which is very long and has shoals. We found here quantities of vines on which the unripe grapes were a little larger than peas, and also many nut-trees, the nuts on which were no larger than musket-balls. These Indians informed us that all those who lived in this region cultivated the land and sowed seeds like the others we had previously seen. This place is in latitude 43 degrees and some minutes." 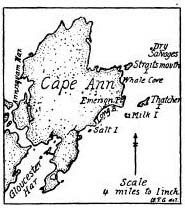 Later in July, the explorers sighted the headlands of the White Cape (modern Cape Cod). In September 1606, led by Jean de Biencourt (1557–1615), Sieur de Poutrincourt, during the fourth coastal exploration, the expedition more intensively explored Cape Ann and other places.